Gabriel Dias, 5, meets Pea-Pa of the Aleppo Shriners Clowns while attending the 60th annual Marlborough Labor Day Parade. 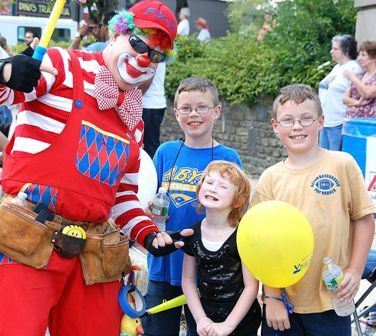 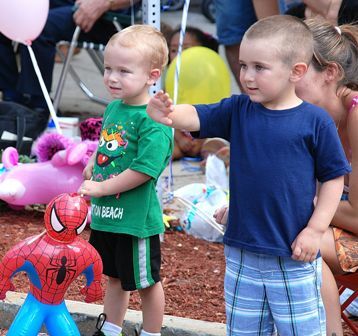 Marlborough – The 60th annual Marlborough Labor Day Parade was held downtown Sept. 5. Over 100 marching units participated in this year&apos;s parade with the theme “Our Children, Our Future.” PHOTOS/Ed Karvoski Jr. 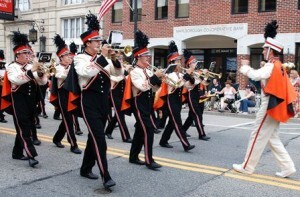 The Marlborough High School Band leads the parade. 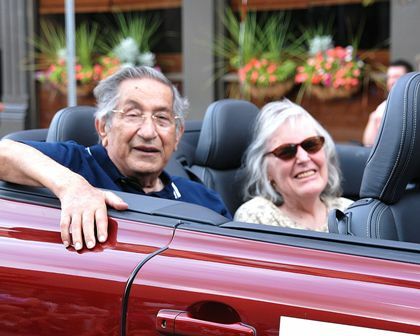 Cosmo Valente and his wife, Hazel, ride in a convertible as he's honored as the grand marshal. 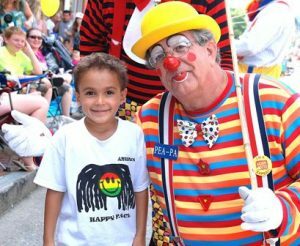 Valente is a downtown business owner who taught music in the city school system for 38 years and served as a School Committee member for 16 years. 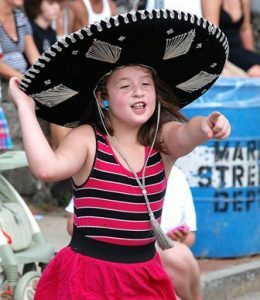 Courtney Dumais, 9, adds style to the sidelines as she enjoys watching the parade. 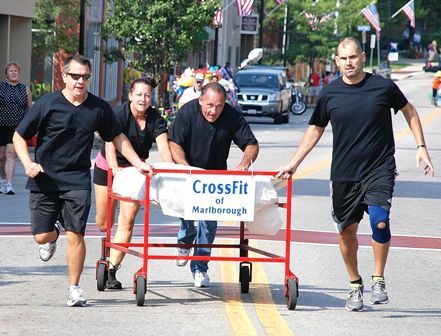 The CrossFit of Marlborough team, consisting of (l to r) Steve Forest, Christine Seymour, proprietor Tom Tecca and City Councilor Rob Seymour, competes in the Marlborough Lions Club's annual Bed Race, held prior to the parade along Main Street and finishing in front of City Hall. 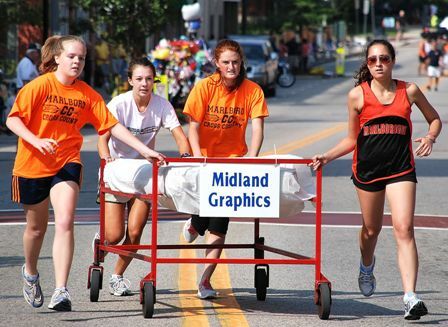 Though they finished the race in good time, the winner was the team sponsored by Wayside Racquet & Swim Club with runners from the Marlborough High School cross country team. The Reminisants, a five-piece band including Marlborough resident Mike Joyal, bring the sounds of golden oldies to the parade route. 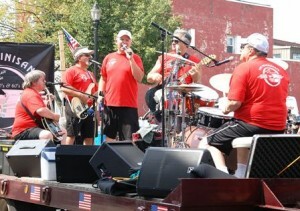 They performed the previous evening at Union Common for the conclusion of this season's Summer Concert Series. 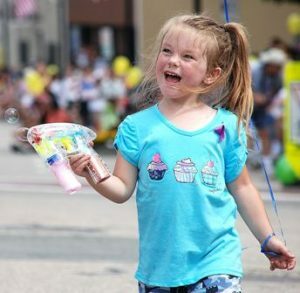 Amber Sweetsir, 5, plays with a water gun she got as a souvenir of the parade. 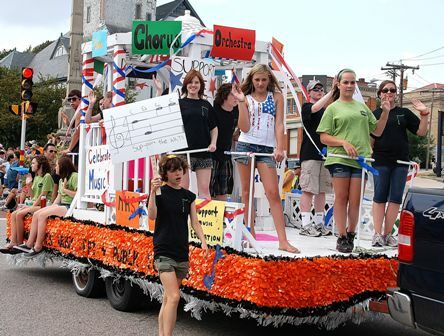 Students ride on a float celebrating the music programs of Marlborough Public Schools. 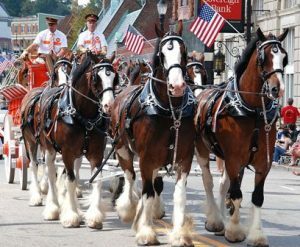 The Hallamore Clydesdales return as a highlight of the parade. Fix-It of the Aleppo Shriners Clowns greets 10-year-old twin brothers Carter and Dylan Gambone, and their friend, Ashlee Thompson, 5. Austin Belmore and Jason LeBlanc, each 3, wave back to the clowns passing by them. 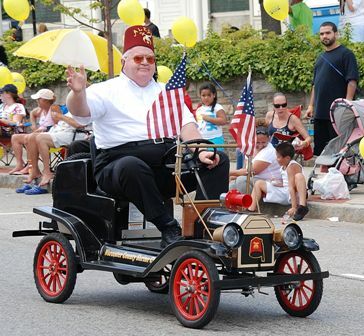 One of several vehicles of the Worcester County Shriners Fire Brigade rides along the parade route. 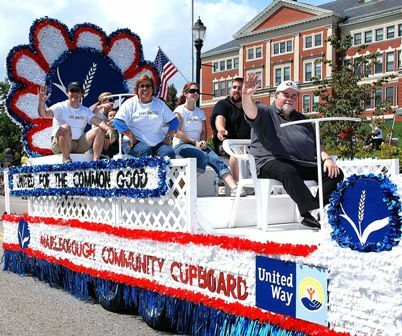 With a float sponsored by Marlborough Savings Bank, the Marlborough Community Cupboard and the United Way share a message: "United for the Common Good." 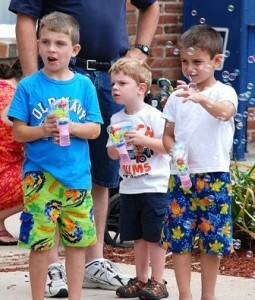 (l to r) Keegan Watson, 6, Cameron Jackson, 2, and Matthew Watson, 5, play with water guns, a popular item found along the parade route. 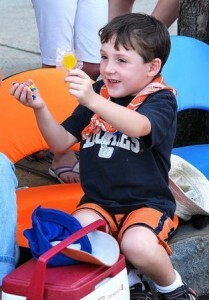 Dylan Stockling, 5, is pleased with candy he received from a parade participant. 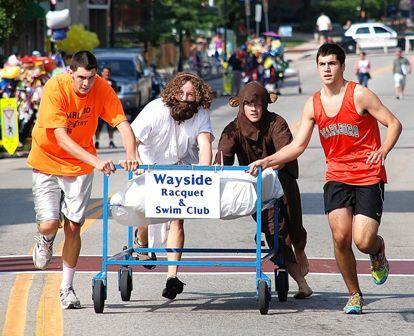 The team sponsored by Wayside Racquet & Swim Club, consisting of Marlborough High School cross country runners (l to r) Jon Perry, Aaron Armitage, Josh Diaigle and Matt Zink, races toward the finish line and captures first place in Marlborough Lions Club's annual Bed Race, held Sept. 5 as part of the city's Labor Day festivities. This is the second consecutive year this team won the race. The team sponsored by Midland Graphics, consisting of Marlborough High School cross country runners (l to r) Shannon Coughlin, Alex Grimaldo, Katherine Zaccill and Sam Perlman, finishes the Bed Race in second place. Twelve teams of four racers partipated.